The gyroscope has been a classic educational toy for generations. Produced since 1917, the gyroscope has been a classic educational toy for generations. It continues to fascinate young and old alike with its mysterious force that seems to defy gravity. This is an excellent tool to teach gyroscopic inertia. Gyroscope technology is used in numerous applications of everyday life; can you name some? 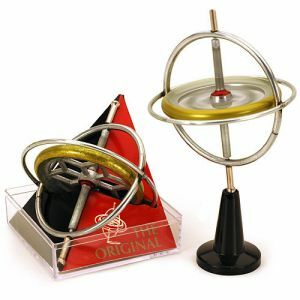 With each Tedco Original gyroscope you get a clear plastic cube to store and display your gyroscope, starting string, pedestal and a complete set of instructions for several amazing tricks. Perform feats that seem to defy gravity. Your gyroscope will spin on its pedestal, dance on a string tightrope, balance perfectly on the lip of a drinking glass... imagination has no boundaries! Will balance on the smallest thing while spinning at impossible angles!